Now for part two of my review of the last decade — and my apologies about being a few days late — whereI review and weigh in on the biggest stories of the 2000’s in the world of football. Thanks to all who read the first installment where I shared my choices for the Best XI of the decade, and sorry if I enraged you with my selection of Gary Neville. This caused a surprising uproar amongst the regular readers… who knew? But keep the comments and e-mails coming; I appreciate the feed back. It’s been an eventful ten years, full of shocks and surprises. With that in mind, I’m sure that I will forget something huge. So let me know what you think I’ve left out. As the saying goes, “money talks,” and Real Madrid has certainly done a lot of talking in the last ten years. Club president Florentino Perez revolutionized the sport by spending more money on individual players than most clubs would be willing to spend during an entire transfer window. Not only that, but he’s done it twice. In the early part of the decade, he brought in the likes of Figo, Zidane, Ronaldo, Beckham and Owen. And upon being reelected last summer, Florentino worked his magic again by capturing Kaká, Cristiano Ronaldo, Karim Benzema and Xabi Alonso. Perez realized that signing the world’s best players could not only bring you great success on the field, but they can also bring a lot more money back into the club through worldwide marketing and merchandising sales. The down side: Madrid’s lavish spending is almost single-handedly responsible for the wild inflation in transfer prices now standard in the transfer market. Corruption is hardly a new concept in Italy, which makes it all the more surprising that everyone was so shocked by the news that several of Italy’s premier clubs were heavily involved in a deep match-fixing scandal just before the 2006 World Cup. When Italian officials finally came forward with over two years worth of evidence (including taped phone conversations and numerous referee accounts), four clubs were implicated in trying to influence favorable referee appointments: Juventus, AC Milan, Fiorentina and Lazio. The windfall was swift and harsh, especially for Juventus. The bianconeri were stripped of their 2005 and 2006 Serie A titles, relegated to Serie B, and were handed a further 9-point deduction. The rest of the clubs were spared relegation, but were handed heavy point-penalties for the 2006-2007 seasons (including a 17-point deduction for Milan, which helped to keep them out of the following campaign’s Champions League). Well it only took FIFA sixteen editions of the World Cup finals to realize that they had been a little biased in awarding tournaments to host countries. Up until the 2002 edition, every single World Cup had either been held in Europe or the Americas. However, after seeing the amazing success achieved in 1994 in the United States, FIFA began to realize that there was a great untapped (profit) potential to hold the tournament in non-traditional football markets. First was the 2002 tournament jointly hosted by South Korea and Japan, which has resulted in a huge growth in interest the game in Asia. In turn, that spawned a massive boost in profits for the Premier League in particular. Then FIFA took another gamble, awarding the 2010 edition to South Africa. Whether or not this provides another financial boost for the game remains to be seen. But if nothing else, the passion the African continent has shown for the sport in the lead up to the cup is promising. Though I guess it could only really be called a miracle if you support Liverpool! 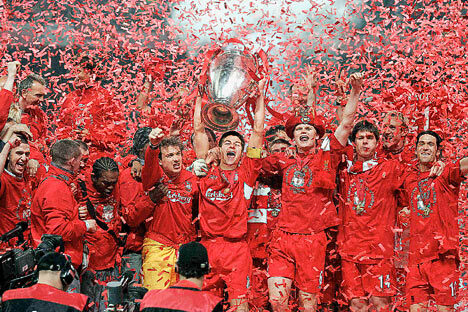 Either way, the 2005 Champions League final contested between Liverpool and AC Milan was a match for the ages. In the rare case that you can’t recall the game, I’ll do you the favor of providing a recap. After falling behind 0-3 in the first half, the Reds staged an unbelievable second half comeback to tie the game before the end of regular time. Inspired by stunning performances from Steven Gerrard and Jerzy Dudek (funny, it’s nearly impossible to say “stunning performance” and “Jerzy Dudek” in the same sentence any longer), the Scousers netted three times in six minutes and eventually prevailed on penalties. This was easily one of the best games I’ve ever watched, and if you some how missed it, find a way to watch it… NOW. who could forget zidane’s gaffe in the 2006 world cup final? Zizou, already a living legend due to a sparkling career with a winner’s medal from nearly every single major championship (1998 World Cup, 2000 Euro Championships, 2002 Champions League, a La Liga and multiple Serie A titles), was possibly just minutes away from adding another title and cementing his legacy as one of the greatest ever players. Prior to the tournament, he had announced his plans to retire from professional football after the title-deciding final. Sadly, that’s not the way it went down. Regardless of what center back Marco Materazzi must have said, his words must have been harsh enough to make Zidane become temporarily insane. As evidence, the Frenchman headbutted the Italian to the floor. Zidane controversially was shown a straight red (it is widely believed that all of the reffing staff missed the incident, but that the fourth official saw the replay on the jumbotron and advised the center ref to award the red), and he would then miss the penalties, where France would lose the shootout. Unfortunately, and especially for Americans who are not as familiar with the game, Zidane’s legacy now centers around a single, ill-timed foul. I really doubt that you don’t know anything about this subject. But i’ll write about it anyway, like you have no clue what i’m talking about. Ten years ago, it would have been unimaginable to have the biggest name (notice how i didn’t say the best player) in football playing in MLS. But that became a reality on January 11, 2007, when the former England captain David Beckham signed a five year contract with MLS’ LA Galaxy. So how did he end up here? When beckham signed the contract, he was currently (and stupidly) being left out in the cold by both Real Madrid and England, with no end in sight to his expulsions from either team. He probably thought his time had passed, and that it was time to make his long-predicted move across the pond. The league changed their salary cap rules to make his astronomical salary possible, all in the hopes that Becks would be able to raise the profile of the sport in this country. While his on field success has been limited during his time in the States, he’s arguably done what he was brought here for. Evidence: the most ticket requests for next summers World Cup are not coming from soccer-crazy countries such as England, Brazil or Spain… they’re coming from the good old US of A. Thanks, David! The most recent story on this list may not seem like such a big deal, at least right now. But trust me when I say that this story will have steep implications down the road. Chelsea’s illegal recruitment of French starlet Kakuta from Lens shined the spotlight on how many elite clubs are robbing small clubs of their best talent at a very impressionable age. Recruiting these players in before they sign a professional contract means that the club won’t have to pay a significant transfer fee to the club that spent all of their time/money/efforts on developing the player. As a rising star at the age of 14 or 15, how could you say no to a club like Chelsea? I certainly could, but only because it’s Chelsea… I hate Chelsea. But had any other top club offered, I would have jumped at in less than a second. It’s for that reason that I fully expect that this story will eventually lead to some sort of restrictions of the transfer of players under the age of 18. If in the spring of 2004 I were tell you that i knew that Greece were going to win that summer’s European Championships, you would have laughed so hard you would have wet your self and then slapped me in the face with your newly wet pants. And that’s exactly how the world felt when Greeks stunned the field and pulled of the Cnderella stories to end all Cinderella stories. After all, how many Greek players can you name off the top of you head? I’ll give you a minute… still no answer? Yeah, that’s what I thought. And FYI… Georgios Samaras hadn’t even made his full international debut at that point. To make the title even more juicy, they had some spectacular results during the course of the tournament: a tie against 2008 Champions Spain, a quarter final win over reigning champion France, a semifinal win over the Czechs, and two wins over heavily favored host Portugal (including the final). The scene: the 2003 Confederations Cup semifinal. The participants: Marc-Vivien Foé and his African-champion Cameroon side, facing off against Columbia. In the 73rd minute, Foé collapsed near midfield with no one around him. For the next 45 minutes, trainers and emergency medical staff desperately tried to restart his stopped heart, but to no avail. Cameroon courageously decided to play the final just two days later to honor their fallen teammate, and ended up losing to France. An autopsy later revealed the Foé died of previously undiagnosed heart condition called hypertrophic cardiomyopathy, helping to shed light on players needing to be evaluated for such potentially life threatening conditions. Remember the fuss that everyone made when Russian billionaire Roman Abramovich (net worth at the time: $11 billion) bought Chelsea and flooded the market with millions of dollars to build his own all star team? On the final day of the 2008 transfer window, Manchester City’s secret takeover by the Abu Dhabi United Group (estimated net worth: hundreds of billions of dollars) suddenly made Chelsea’s billionaire seem like the poor kid on the block. The new Arab owners promised to make Cit-eh into a title contending side, and immediately followed up by landing Robinho from Real Madrid for a British-record £32.5 million. Since then, the Citizens have spent £100 million plus to land a bevy of stars (Gareth Barry, Roque Santa Cruz, Kolo Touré, Emmanuel Adebayor, Carlos Tévez and Joleon Lescott)… although all those millions haven’t been able to keep City in the top four or spare manager Mark Hughes the axe. I guess that’s predictable though… I mean it is City. haha by surprising uproar over your choice of nevelle do you mean my one comment? no, i received a few e-mails slandering my choice of neville as well. and by a few, i mean approximately three.